Optimized for user experience and readability! A pillar page is a single website page that covers a particular topic broadly, but comprehensively — with the intent to rank well in organic searches for a specific, high-volume search term. Typically, pillar pages are much longer than regular pieces of content and blog posts. While there isn't a word count that makes your page a pillar page, depending on your industry and topic, it could range somewhere between 3,000 and 6,000 words. The content on a pillar page provides a very broad, high-level overview of all aspects of the overall topic you want to rank for. It is supported by specific, more in-depth sub topic pages, that dive into the aspects of each topic in greater depth. Essentially, you can think of subtopics as child-content and pillar pages as the parent page that organizes them and puts them in greater context. Together, the pillar page and its supporting content form a content cluster. Should You Create A Pillar Page? One question that always arises is: "Should I create a pillar page too?" And it is a great question. After all, we have all seen the mindless content regurgitation over the past few years that makes it almost impossible for honest, value-adding content creators to stand out! So, do marketers really need another vehicle to produce even more? As with any content creation, consider the impact your writing has on your buyer personas. If you have a unique point-of-view or perspective, your topic hasn't been covered extensively before by others, or you can create something truly beneficial, you should absolutely go for it! Can I Use A Pillar Page To Organize My Current Content? "Haven't we already written a blog post very similar to that?" "We really should organize our blog posts so people can find what they are looking for." "If only I had the time to go back and interlink the older blog posts with the newer ones..."
If that rings true for you, a content pillar page, or just pillar page, might be just what you need! But even if you are just starting to embrace content marketing, a pillar page can help you get faster results than dozens of unconnected blog posts! By listing and explaining tried and true industry best practices, strategies, or techniques for readers to emulate or implement themselves (Inspiration Pillar Page). 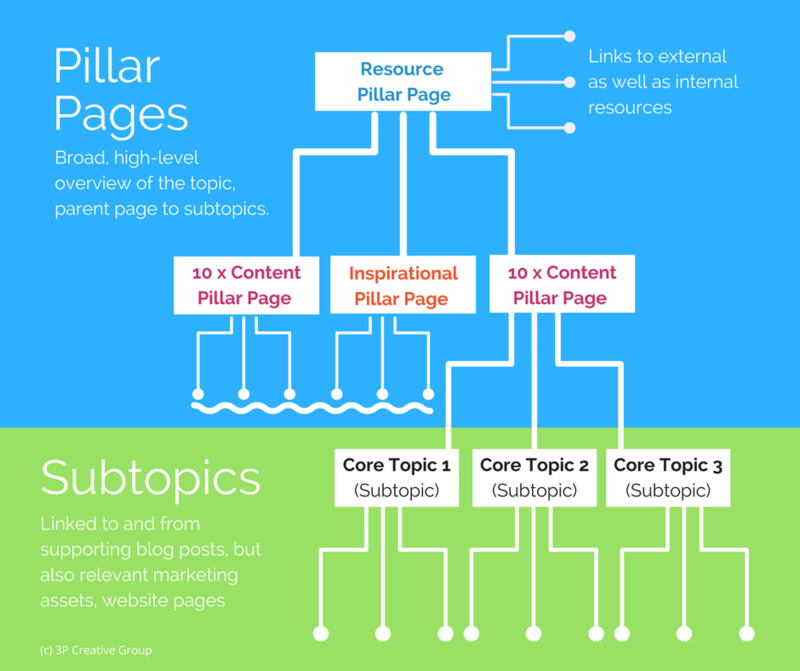 While all types of pillar pages can be used as a stand-alone tool, you can view a Resource Pillar Page or even an Inspiration Pillar Page as the parent for 10x Content Pillar Pages. Do you have a lot of existing content around the same topic that needs to be organized in a logical order? Has the topic you are trying to create a pillar page for already been covered extensively by you or other reputable sources? If the answer is yes, then a Resource Pillar Page might be the way to go! Attract desired back links from the resources you are linking to as well as other reputable sources. 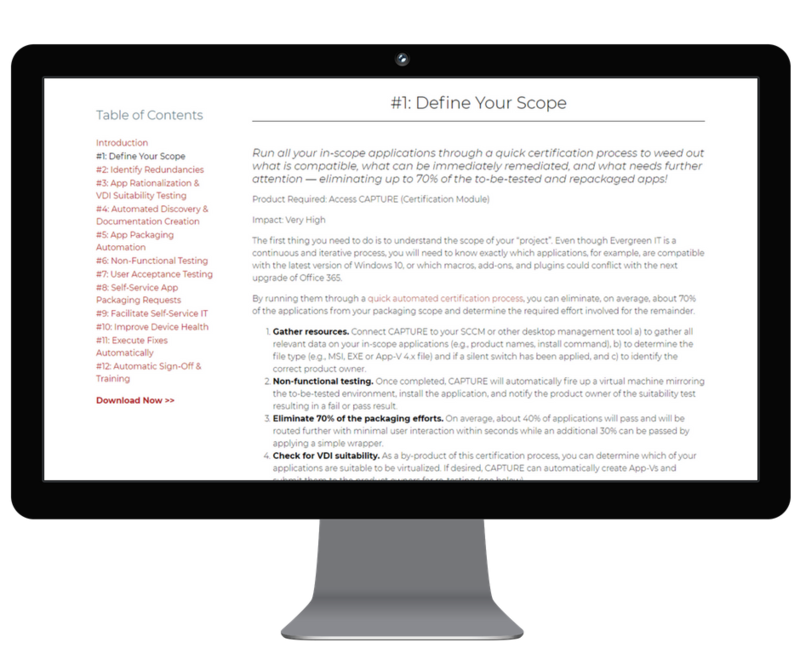 Essentially, think of a resource pillar page as a huge catalog or index of internal and external incredibly useful resources that have been pre-selected, put into a greater context, and organized on one intuitive page. This is a huge value-add as you are saving your reader the trouble of scanning countless websites to find the very best ones: you have already done this tedious and labor-intensive step for them! For example, an enterprise IT project manager will find it tremendously helpful to have all relevant Windows 10 Servicing resources (from Microsoft's road map to practical implementation advice and how-to tutorials) in one place, whereas a content marketer will get benefits from a list of different customer acquisition strategies leveraging content marketing. Above the fold: A prominent H1 header, a short introduction or definition of the targeted reach term, an easy-to-navigate table of contents, and possibly an author tagline. Below the fold: Different sections of chapters that each have an H2 header, a short introduction, and a long list of internal and external links. But don't let the page design scare you away from creating a rockstar resource page! There are plenty of templates on the HubSpot Marketplace, but you could also take a multi-column page and adjust it easily to fit your needs. A 10x Pillar Page is the foundation of your pillar page strategy. While it can serve as a child page to the above mentioned resource pillar page, a 10x content pillar page is very effective as a stand-alone page. Essentially, it is a long-form piece of content (4,000-6,000 words depending on the topic and industry) that covers a well-defined topic very comprehensively. It links to and is supported by smaller subtopic blog posts that dive deep into each specific subject in more detail. Become the go-to subject matter expert resource for this topic. Above the fold: A prominent H1 header, a short introduction or definition of the targeted reach term, and some important meta information, e.g., last date this content was updated, the audience the content is intended for, and how long it takes to read the entire page. Below the fold: Because this page will have much longer text sections than a resource pillar page, it is important to be able to create different chapters and sub-chapters with different header types. Don't forget to use images to break up the text and include links to your other related content. Sidebar: Be sure to include social media sharing icons, "Email the page to a colleague" button and/or "Bookmark this page!" button, a floating navigation menu to allow your reader to jump to interesting sections, and an option to download the content for later offline use. Below the content: Call-to-Action section for a consultation, demo, or other Bottom-of-the-Funnel offer. The most important thing to keep in mind here is readability! Pick a font that loads fast and is easy to read (e.g., OpenSans, Raleway, Lato, Montserrat, or Roboto), make sure your page is uncluttered, organized and has plenty of white space. For example, this template uses a text to white space ratio of 3:2. If you have read up on pillar pages before, you might not have heard of this one yet, but we believe it deserves its own category: the Inspirational Pillar Page! An Inspirational Pillar Page is a collection of ideas, strategies, best practices, points of view, or expert advice that has been collated with the intention that the reader might get inspired to pick out a few and try them out herself/himself. An Inspirational Pillar Page is very similar to a 10x Content Pillar Page — with one major difference: it is a large list of inspirational ideas, industry best practices, project suggestions, or anything similar. As an example, have a look at Access IT Automation's "12 Ways the 'Fast & Bold' use IT Automation to achieve Evergreen IT". The page provides IT managers and executives with a dozen ideas on how to use IT automation to continuously improve the health and stability of their IT environment. While all ideas build on each other, they can be implemented separately. Each idea gives the reader a short overview, the products used, as well as the potential impact. This is the hardest part so be sure to choose your subject carefully. 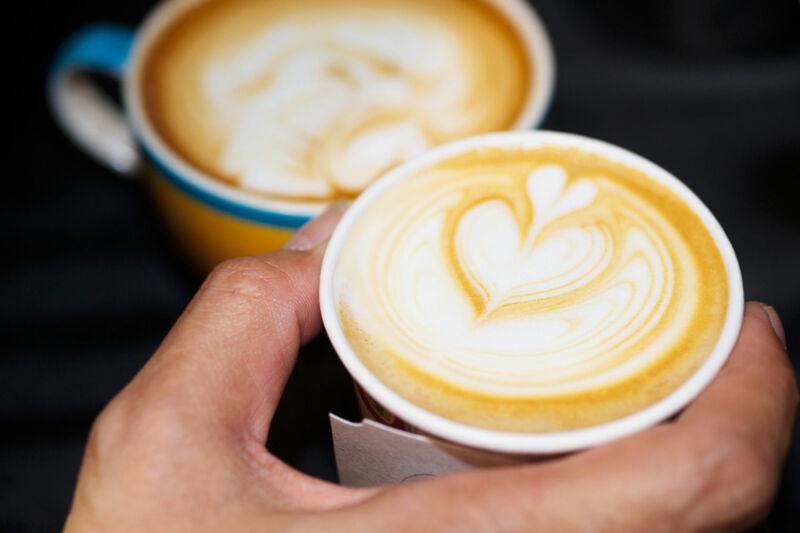 It needs to align with your buyer persona's needs, be very relevant to your business, generate enough search volume, and have enough breadth and depth to be explored further in more detailed sub-topic posts. After picking your main topic, thoroughly audit your existing content. If you are already using the HubSpot Content Strategy tool, you will already have a significant head start. If not, now is the time to add a topic cluster for your pillar page subject and link all existing content assets. Ask yourself if there is anything that needs re-writing or updating. Create an editorial calendar to fill any gaps and other sub-topics you wish to expand into. Resource Pillar Page if you have most of the content already in house and/or the topic was extensively covered by external sources but you need a page that organizes it all into a bigger picture. 10x Content Pillar Page if you picked a topic that has not been previously covered but deserves to be and you have the thought leadership, research, and knowledge to do it. Inspirational Pillar Page if you want to showcase different project ideas, industry best practices, and other inspirational ideas. 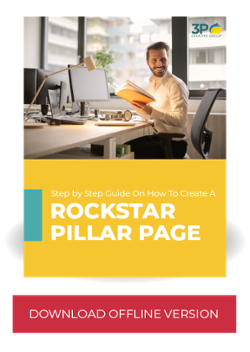 Too many marketers get hung up on the design aspects of pillar pages thinking if they cannot publish a rockstar pillar page, then they shouldn't publish one at all. But don't let that deter you. There are plenty of great, easy-to-use templates on the HubSpot Marketplace that allow you to start right now. In fact, this page is built on the Mollison Pillar Page Template, named after the father of Permaculture, Bill Mollison. Now, the easy part begins: writing. Outlining your content in chapters, sub-chapters, and bullet points will help you stay on target. Since this will be a very long piece of content, you have to make sure you write on point and don't waffle on. After you are finished, it helps to let it sit for a day or two and revisit it again. Don't forget to get someone else to edit it! Once you hit publish, you might want to sit back and wait. But your work isn't done just yet. Be sure to optimize all the on-page SEO (like writing a meta description, adding alt image tags, ensuring you are using H1, H2 correctly, etc.) and link it where appropriate. Again, let your content clusters guide you to find the right articles to link to and from, but be sure they are relevant to your topic. Finally, add Call-to-Action buttons strategically over your website (e.g., blog sidebar or under relevant blog articles) and promote it via email, social media, and whatever channel you usually utilize to get the word about your content out. Now, you are done — congratulations! Think topics, not keywords. Or as Hubspot in its Topic Clusters: The Next Evolution of SEO puts it: "The key is to start thinking in terms of TOPICS you want to own, not just KEYWORDS. This allows you to own a 'sphere of influence' on the internet." Creating Pillar Pages is like gardening. The more you put into it, the more you get out of it! So be sure you go above and beyond with researching and organizing your raw material before you carefully write, format, and edit your content. Focus on your buyer persona's needs. I cannot stress enough how important it is to align your content with the needs of your buyer persona and make it unique and valuable! The better you hit that target, the higher your return on investment will be! Support each Pillar Page with sufficient subtopic content. Each pillar page serves as a parent page to subtopic pages or blog posts that are designed to answer a specific aspect of the topic at hand. These link to and from supporting blog posts, marketing assets, and website pages. This step is critical. Follow current on-page SEO best practices. This should go without saying, but it often gets neglected. Be sure to reference your desired reach term and relevant synonyms in the H1 header, the title tag, the page title, the meta description, and image alt texts — without keyword stuffing your page! Use H2 and H3 for subheaders. Optimize For Google Snippets. Learn how your content can be optimized to be featured in a Google Snippet. One way is to include a very short definition or description of your core topic to help define the subject of the entire page. Format this section in H2 if possible. Enjoy creating your pillar page and please contact us if you have any questions or get stuck along the way! Copyright 2019 3P Creative Group.